A few weeks ago a colleague of mine at work expressed delight as he looked over my shoulder at work and saw a large photo, the first such photo ever, of a Moustached Kingfisher. The species was in the news because some scientists had finally managed (or bothered – it’s much the same thing) to locate the population high in the mountains of the Solomon Islands, and catch and photograph one. What wasn’t publicised at the time, but the scientist later both admitted and owned, is that the kingfisher was then killed and collected for scientific reasons. I’m not going to rehash the arguments for scientific collecting here. If you want to know why most scientists support collecting this piece in Science explains it better than I can. I can understand why some people are conflicted, but the value to science of the collections is immense. I worked with an enormous collection of bird skins in the collection of Te Papa (The National Museum of New Zealand) during my (unfinished) PhD. The majority of the collection had been made in a haphazard way during the Victorian era, with a much smaller contribution made in the modern era mostly from incidental mortality. The large room the collection was held in was a profoundly weird place. Shelf after shelf after shelf of trays of dead birds, most with their original archaic Victorian era label written in spindly cursive attached to a leg. Box after box of egg. Unsurprisingly the ones that most stick in the mind were the lost species. I took measurements from Chatham Bellbirds, Chatham Fernbirds, and South Island Snipe. I remember looking at a single skin of a Long-legged warbler from Fiji, the only known specimen or record of its particular subspecies, the sum total of all knowledge about its kind. And most haunting was the cupboard of mounted specimens of extinct species. New Zealand Bitterns. Huia. Piopio. Bush Wrens. This collection isn’t some ghastly memorial or symbol of human stupidity. It’s a scientific collection, and has and is used by scientists to expand what we know about birds. Before Richard Owen hit on the inspired idea that museums could be places for the education of the masses, they were simply large collections of important objects used for academic research. Today one can’t help feel Owen’s idea has been turned on its head. Museums have become about the visitor’s almost exclusively, if you ask a curator. Their original and crucial function is being lost as museums struggle to balance the books and keep the punters amused. Predictably this distinction is lost on the section of society that a) knows very little and b) enjoys overdosing on outrage, and they were, well, outraged by the death of a single bird (in a way they aren’t by say the loss of an entire species to deforestation). In part this was due to the outstanding way the reporting was handled by the press. If you feel like spelunking into stupidity and bile, have a read of the comments section of the Daily Mail article. And if you thought that the first line of my last paragraph came across as elitist, patronising and smug, well, you aren’t the only one. Because it did occur to me that we have a massive problem here. When I first heard that the kingfisher had been collected my response wasn’t “why?” but a groan and a “why on earth did you tell anyone?” I feel that way about hunting as a conservation tool too sometimes, wondering if perhaps its best to not tell people what conservationists and scientists do because people get angry about the wrong things. And that also worries me greatly, because that’s a profoundly cynical and undemocratic way to think. So it was the right decision for the scientist to bring it up. We should be honest about science and conservation, even if it isn’t always the easiest path. Featured image Drawer of Eriocnemis study skins. Swedish Museum of Natural History – Naturhistoriska Riksmuseet,Stockholm, by Notafly (CC). As a biologist I understand collecting, but I’m not overly keen on the practice. (Weren’t scientists responsible for killing off the last 8 Great Auks just so they could have a specimen?) And I once met a renowned collector (primarily of eggs and nesting material) who seemed firmly attached to his gun until the day he died – yes, he was literally collecting up until the time he died. Long story short, I feel like the justifications for collecting are often stretched to the extreme. And maybe it’s not the same, but it seems like every day some “world class city” needs to beef up its museums, zoos, or aquariums. And just as frequently you read about and see photos of some place like the Sarajevo’s museum of natural history and its contents being used for target practice… and then 10, 20, 30 years down the line the process starts all over again. Anyway, I agree wholeheartedly with the post. People are idiots and unfortunately that will never change. @Ron the letter to Science I linked to addresses some of your points- for example with the Greak Auk is it fair to blame collectors taking a handful of specimens over hunters taking thousands of birds? Any species that is so reduced that taking a single specimen will doom the species is almost certainly doomed anyway. Well said Duncan, especially this- “outraged by the death of a single bird (in a way they aren’t by say the loss of an entire species to deforestation)”. 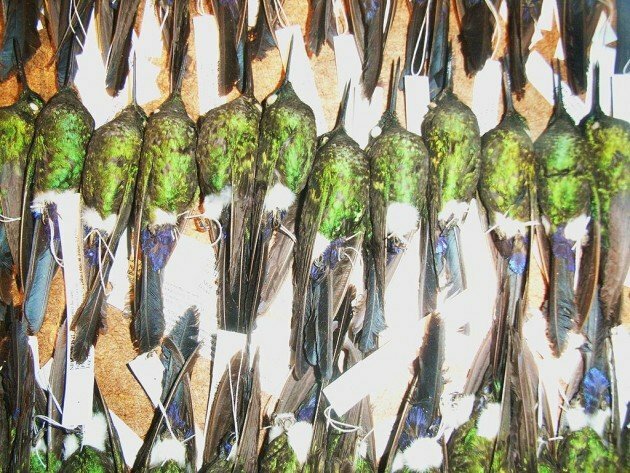 As much as we cringe about the idea, the effects of killing birds for scientific collections are absolutely nothing compared to the wholesale destruction of ecosystems that eliminates millions of birds, other priceless biodiversity, and also increases the likelihood that our children and future people will experience wars and very difficult times on a home whose natural resources have been exhausted. That is such an idiot argument to trump one moral issue with a bigger one. How old are you 14 ? @Lian- I don’t see how the argument is so idiotic when the moral issues are related (as was hinted at by Duncan). In this case, we are talking about outrage over killing a very limited number of birds for scientific purposes while we don’t see the same degree of outrage from the same people for massive destruction of habitat that not only kills huge numbers of birds (directly and indirectly), but also ensures that those affected species cannot repopulate former habitat (because it is gone). In the case of limited collecting, as long as the habitat is still there, young birds take up empty territories that were used by birds that were collected. In the case of massive habitat destruction, everything that lived there is gone and isn’t coming back unless the habitat can be restored (and even then, maybe not). What I am saying (and I gather Duncan is too) is that if the moral issue we are really talking about is killing birds, then there are other factors that merit far more attention that scientific collecting. Or, do you feel that it is less of a moral dilemma to kill millions of birds via pollution, windows, poisoning, and habitat destruction because that is more indirect and we don’t see it? With the caveat that age isn’t necessarily correlated with knowledge, do I sound like I’m 14? I agree Patrick, but I suspect Lian’s disagreement is even a little deeper. She seems to be arguing from a position of moral absolutism, that it is always wrong to kill animals. I’m arguing for a more consequentialist position, where the end result of killing an animal needs to be considered when deciding whether the death was acceptable. It will be difficult to find common ground with so fundamental a break in starting points. It’s perhaps a dangerous oversimplification, but perhaps this deep division over worldviews actually captures the division between animal rights and conservation? Something to think about. @Duncan, it’s been 20 or more years since I read up on the Great Auk so I would have to look it up to confirm, but my recollection is that THE LAST EIGHT were collected for specimen. No different than the last eight Black Robin being collected and that species driven to extinction instead of being preserved up to now. Otherwise, I said I completely agree with your post. @Ron – It is important to distinguish between what caused a species to go extinct and what caused the last few individuals to die. Massive overharvesting caused a catastrophic collapse in the number of Great Auks. If the species was down to 8 it was already almost if not actually effectively extinct at that point. Taking specimens for science did not cause the catastrophic collapse, so it wasn’t the ultimate cause of its extinction. Also, well, if you search through my back posts you’ll see that I have quite a lot to say about hunting and conservation. But that’s somewhat of a derailment. Hmm…seems to me an aspect of this issue is being overlooked (admittedly haven’t read the linked articles), but one that, for reasons explained below, tends to–literally–stare me in the face. That aspect is the human acquisitive impulse that’s expressed OUTSIDE the scientific context, one which is pandered to by a billion-dollar industry, which causes death and suffering for millions–maybe billions–of wild and domestic animals, and which those who decry scientific collecting seem to have ignored. I refer to the ‘pet’ industry, which in terms of depletion of wild stocks AND proven potential for introduction of deleterious invasive species has to rank as one of the most directly destructive of all human outrages perpetrated against wildlife. The reason it’s ‘staring me in the face’ is because there are five terrariums in my office, thickly planted with Boston fern, Laudacchia, papyrus, terrestrial outgrowths of fine-leaved Ludwigia, water-sprite and java moss, and masses of floating water-lettuce on the portions of those tanks covered with ~2-4″ of standing water. Staring from inside those tanks are four generations of Oriental Fire-Bellied Toads (Bombina orientalis). I don’t know for sure how many there are because they hide in the plants and the water really well, but I estimate they number ~50 individuals. They’re descended from five specimens, one male and four females, that were given to me because those who’d originally ‘owned’ them lost interest in caring for them. That was about eight years ago. The original five–a male and four females–still reside in the tank I set up for them in my office. They’re the great-grand toads. Their children, grandchildren and great-grandchildren live in additional planted tanks. I mention this because these small creatures, which as adults are only slightly bigger in diameter than a US quarter, can live for 30 years. That’s way longer than the attention-span of most American ‘pet’ owners. And they’re imported by the MILLIONS from China and Korea annually to satisfy privileged Americans looking for the next novel ‘pet’. The novelty soon wears off. Those few that didn’t die in misery during overseas transport die in misery in display tanks at Petco, PetSmart, etc, their housing designed to enhance sales, not the well-being of the sold. Disposable commodities. And most of those that actually make it into the hands of ‘consumers’ don’t live long after that. “Consumer’ is the right word. That’s just one example. Another: Egyptian children no longer know the Arabic word for ‘tortoise’–salhufa–because all the delicate little Egyptian tortoises have been collected out for the pet trade, their habitat usually destroyed in the process by impoverished Bedouin hoping to make a few dinars to feed their families. Today this species is being collected in nearby Chad. And most of them die in the ‘suk’ (marketplace), or in transit, or from neglect by ‘pet’ owners unable or unwilling to properly care for them. Another is a beautiful little electric blue gecko–critically endangered–that is only found in the crowns of one species of pandanus tree that is itself critically endangered. Starving Africans are paid pittances by ‘pet’ exporters to cut down the trees and collect the lizards so pampered westerners can lounge in their living rooms and be entertained watching the little blue lizards scramble up and down the walls of their cages. Until the next ‘exotic pet’ catches their fancy. Sadly I could offer example after example. Researchers complain that professional ‘pet’ collectors are depleting populations of newly-discovered reptile and amphibian species almost as soon as they’re described. For this reason some have refused to publish sites were archetypes/holotypes were found. To end on a positive note, last year a nine year-old girl and her doting and supportive father approached me about Fire-Bellied Toads. The little girl had devoured every book she could find, and set up a beautifully-planted, semi-aquatic terrarium in her room. She plied me with questions concerning their care (because of her diligent studies she knew nearly as much as I did). And of course I gave her seven toads–two from generation three and five from generation four. And they’re thriving. The males sing to her at night, as mine do. My hope is I’ve contributed to the development of a budding young biologist who will work to emeliorate the damage my and previous generations have done to our environment. Her thank-you card, featuring a very well-done crayon drawing of a Fire-Bellied Toad floating in water, also stares me in the face from my office wall. I’ll take small victories if I can’t do better–Inshaa Allah. I have a much more prosaic comment: You’ve fallen into the “put-an-apostrophe-before-every-terminal-‘s’ camp. Check the sentence after the last mention of Owens. What is the State Bird of New Hampshire?